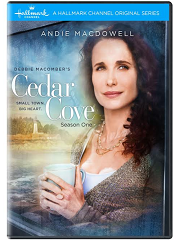 Debbie Macomber’s Cedar Cove Season One DVD Giveaway! Fine Print: I was given a copy of the movie for review and . All opinions and statements below are my own. When I first took real notice of Andie MacDowell, it was years ago in the movie Green Card. I know you know that movie!! This beautiful and smart woman also didn’t seem to fit in Hollywood. I always felt that she was a small town girl at heart (and from what I’ve read, I believe she actually is!). Now she stars in the Hallmark Channel’s Cedar Cove, which just started it’s second season. Co-starring Dylan Neal (50 Shades of Grey) and filled with breathtaking scenery, the touching drama follows municipal judge Olivia Lockhart (MacDowell) who resides in the small town of Cedar Cove. Recovering from both a divorce and the death of her son, Lockhart works to find a balance between the challenges of her family and her career, while a potential new romance arises. I saw advertisements for this show in a magazine last year, but only recently got the opportunity to check it out when it arrived on DVD. This is going to sound a little funny, but this show is perfectly placed on the Hallmark Channel. It is about a judge and the law, but the entire time you’re watching, you feel a bit like you’ve been taken back to Mayberry. This show discusses real issues that many real people face, but it’s done with a very light touch. This is just an enjoyable show about small-town people that kind of takes you away from the issues that we see on the news or on other law shows. In fact, I was having kind of a sad day last week, and this was the show I put on. It just takes you away from the problems of the real world. And we can all use a little some of that sometimes, right? To get everyone feeling the small-town vibe, I am giving one lucky winner a copy of the Cedar Cove Season One DVD! To enter this giveaway, complete any or all of the options listed below. Giveaway ends 8/16. Good luck! I enjoyed watching “Seventh Heaven” with my kids when they were growing up. I agree with the person above Andy of Mayberry has been the best. It is still a cute show with its reruns!! I still love The Waltons! I would have to say the Andy Griffith Show. Currently I am enjoying Under the Dome, but in the past it would have to be The Andy Griffith show. Under the Dome is my favorite Small town problems show.